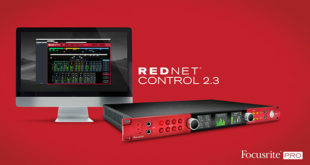 The Red 16Line features Thunderbolt 3 connectivity, but also acts as a Pro Tools | HD audio interface and talks to Dante audio networks. Two Thunderbolt 3 interfaces are available and the networking side is handled by two Ethernet ports. Two mini DigiLink connectors are available to connect Avid’s environment, where the Red 16Line features appear as four HD I/O boxes in Pro Tools | HD. 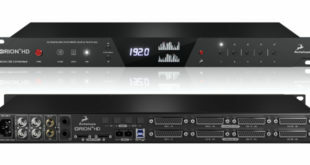 The Red 16Line interface features sixteen line-level inputs and outputs, which are available via d-sub sockets, while digital interfacing is covered via S/PDIF and two optical ADAT connectors. 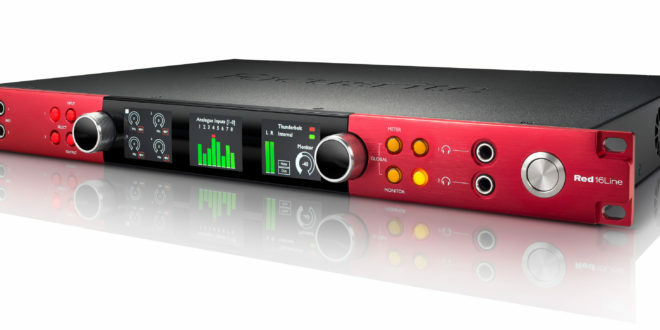 The Red 16Line has two of Focusrite’s Red Evolution microphone preamplifiers, each supplying 48V phantom power, along with a high-pass filter and a phase-reverse facility. 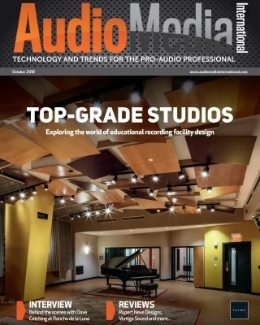 Focusrite has incorporated their ‘Air’ technology which, when enabled, changes the input impedance and frequency response curve of the preamplifier to closely model the company’s original Red and ISA range – all in the analogue domain. The microphone inputs are on the rear panel, alongside the monitor outputs, Word Clock/Loop Sync BNCs and the IEC mains connector. The front panel of the single rack Red 16Line has some quite useful features. The two instrument quarter-inch jack inputs are welcome, but I couldn’t help wishing the microphone inputs were here as well (they are on Focusrite’s Clarett series). Most of the front panel is taken up by a clear display that acts as both meter and information centre for the various input and output selections, controlled by input and output rotary encoders, the latter of which can be set to control monitor and headphone levels. The Red 16Line also has two front panel headphone jacks. It’s a beautifully built unit and the controls work smoothly. The interface uses the Focusrite Control software, which can be used for setting input and output routings, creating monitor setups and adjusting various other parameters such as sample rate and clock settings. 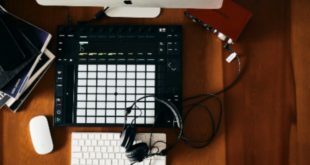 You can control the microphone preamplifiers here as well, choose the meter’s sources and select the type of host connectivity. Network routing requires that you download the Dante control software. The d-sub connectivity makes it very easy to integrate the Red 16Line into a studio environment. Software installation and interface commissioning was quick and simple and the interface was up and running in no time. Focusrite say that the digital converters in the Red 16Line are their best yet and I have no reason to doubt that claim. The analogue line-level interfaces are clean and, for want of a better word, neutral, with bags of low-distortion gain. If you like the sound of Focusrite’s high-end preamplifiers, you’ll certainly appreciate those in the Red 16Line. I’ve noted before that the sonic capabilities of the humble Shure SM57 microphone shines through when paired with high-quality microphone preamplifiers and this proves to be the case with the Red 16Line. The sound of the interface is clean and ‘weighty’ and capable of performing in exemplary fashion with a range of microphones. The ‘Air’ option provides a nice alternative ‘sound’ to the preamplifiers without impacting on their quality in any way. Focusrite also say that the Red 16Line features their lowest round-trip latency and I had no issues when using the unit when recording guitar and bass through various amplifier plug-ins, even at a 44.1kHz sample rate. The interface is capable of working at up to 192kHz sample rate with 24 bit resolution. 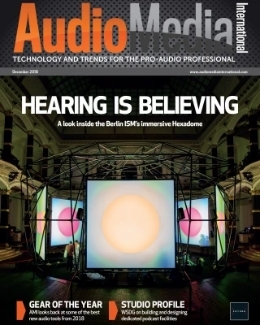 Focusrite say that they want to allow engineers to work with the interface inside a DAW without DSP or external pass-through monitoring and I believe that most musicians would be happy to use the Red 16Line at 96kHz without any extra software or hardware. Connecting the interface to a Pro Tools | HDPCIe card worked right away without any problems. The Pro Tools software ran without a hitch and it’s very welcome to see such a versatile interface being available for users of Avid’s DAW. The nice thing about the Red 16Line is that you can use it as a ‘traditional’ interface. 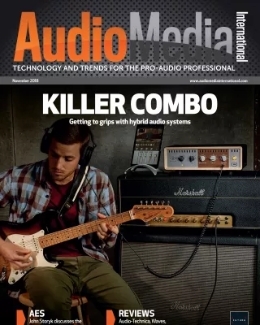 Just plug in a microphone or guitar, press record and go, or as the centre of a high-quality audio network, surround sound system or Pro Tools rig. 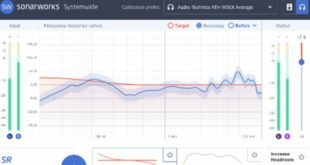 Focusrite call this flexibility, ‘improvised recording’ and it certainly proved easy to move the interface from one application to another during the review period. I went from a studio-based Pro Tools session to recording drums and bass in an old church using the Red 16Line and a few high-end microphone preamplifiers and I doubt that I’d have gotten better results in studios whose daily rates rival the cost of the interface. This flexibility, along with the superb quality of the pre-amplification, digital conversion and the high number of analogue and digital inputs and outputs makes the Red 16Line an extremely useful studio tool.